While this entire website is about anti-aging beauty tips for the face and neck, the ones listed here are my personal favorites. You can find a ton of beauty tips online, but how many really address the needs of women over 40? So, I put together a list of my favorites - the quickest, cheapest, and most effective ones I've found over the years. Plus, a few of them offer instant results....who wouldn't like that? Give a few of these beauty tips a test drive - you might be surprised with your results! This is one beauty tip women over 40 (or under) can appreciate! 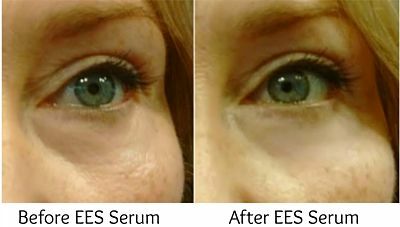 You can temporarily firm and smooth the skin under the eyes in just a few minutes. Who doesn't love instant gratification? Want to see how it works? Visit Hide Wrinkles Under The Eyes to see a close-up before and after picture. One of the most inexpensive beauty tips for face, neck and chest is a simple homemade honey mask. 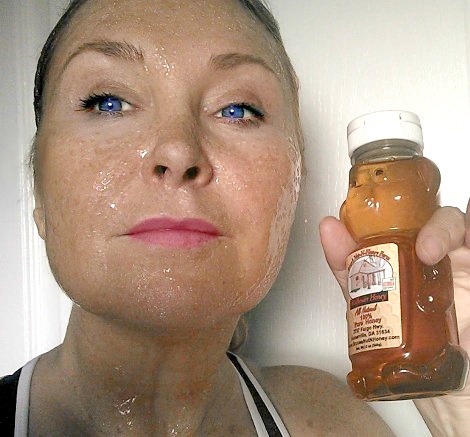 Honey is excellent for dry skin. And, it doesn’t get any easier than this one - because you only need one ingredient……Honey. Honey is cheap and very effective for plumping up parched skin and works well for women and men. The only downside is it's a bit sticky/messy. Honey is a natural humectant - which means it helps pull moisture out of the air and into the skin. Plus, as a side benefit, honey is an anti-bacterial and anti-oxidant - which is fabulous for aging skin. Simply pour few tablespoons of honey into a bowl. Then wrap a towel around your shoulders and massage the honey all over your face and neck. Now, just Sit back and relax for 20 minutes, then rinse off. Bonus Tip: Apply this mask prior to taking a shower. It's easier to rinse it off in the shower. I started scrubbing (i.e. exfoliating) my face when I was 15 years old. Back then, there weren’t many choices, so I settled for a drugstore product called a Buff Puff - a mild abrasive scrubbing pad. But, these days I like to make my own scrubs. 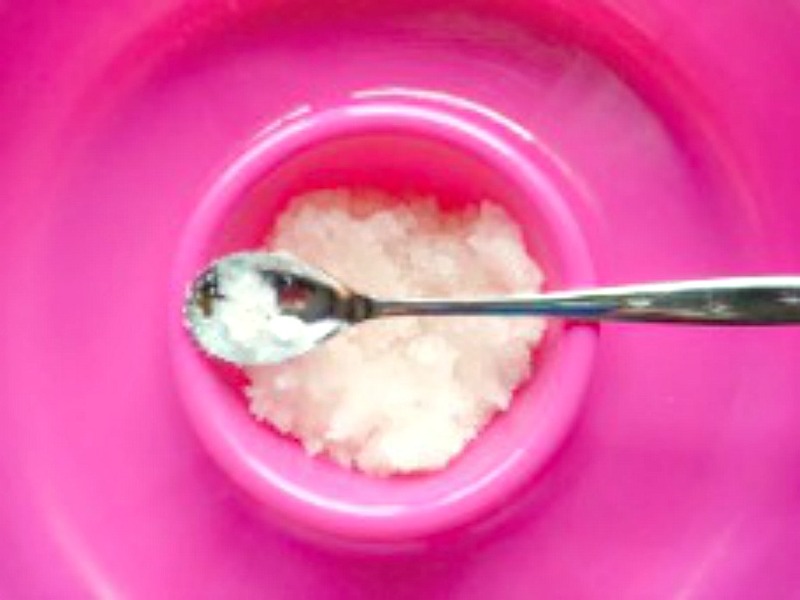 Start by mixing sugar or baking soda with water. If you have dry skin try mixing it with face loving oils like grape seed oil, coconut oil, or even olive oil. Mix into a paste like consistency and massage it gently all over your face - don’t forget your neck. Again, doing this before (or even in the shower) is easier and less messy. Women and men will really see results from this beauty tip! The older my skin gets, the more impressed I am with the results of a good exfoliating facial. 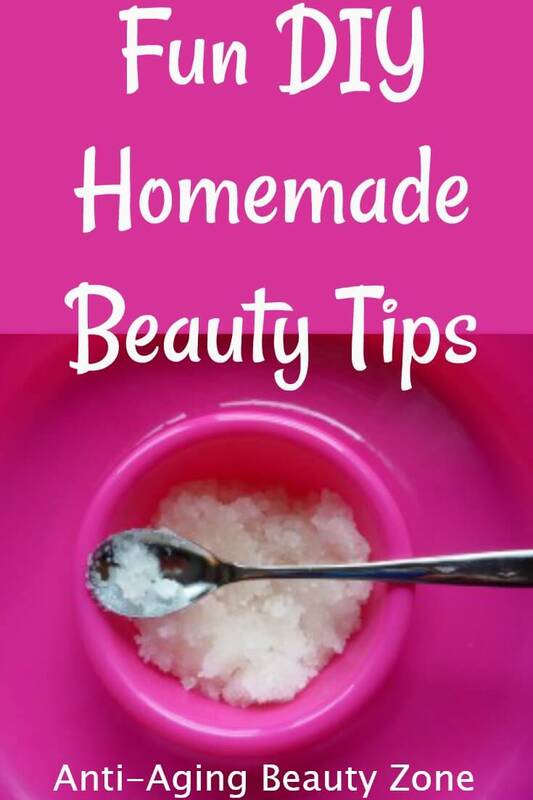 Bonus Tip: If you're using sugar (not baking soda) - leave the mixture on your face and neck for 5-15 minutes (like a mask). Sugar naturally contains alpha hydroxy acids which helps breakup the "glue bond" that holds dead skin cells together. This will give you a beautifully smooth complexion in just minutes! Need Something stronger? Consider the face smoothing Skin Eraser Kit. Click here to see if this is something you would use on your face. 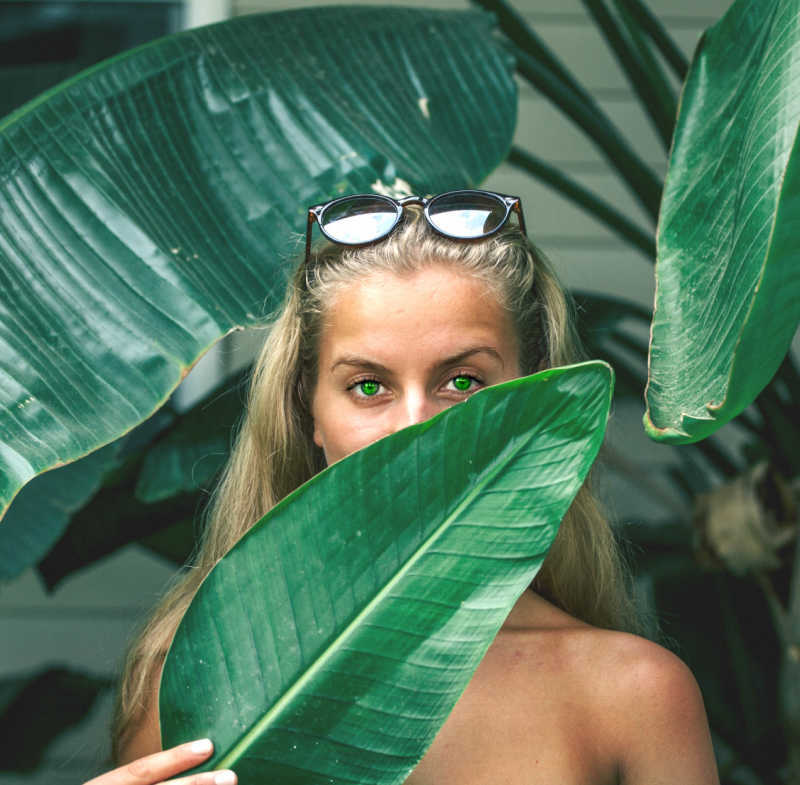 If you've noticed a change in skin tone - more blotchy, spotted or more brown spots……..Self tanning is a great option to smooth out your complexion. Adding a sunless boost of natural color helps hide imperfections like freckles, age spots, and broken blood vessels...All without dangerous sun rays. The best time to apply a self-tanning cream or gel is right after you've exfoliated your face. BUT! With this self-tanner, you can apply it anytime! I love it! Now prepping or worry about drying or staining your clothes. I smooth this creamy anti-aging, vitamin filled cream on my face and body about 2 times a week and it hydrates while helps give my face and body a gorgeous year round glow. Many women have a hard time finding a sunless tanner that works well with their skin tone. Which is such a shame because this is one of the best (and cheapest) beauty tips for the face, neck, and body that offers almost instant results. Why a Quality Self Tanner Matters: Many women have told me that drugstore brand self-tanning creams and sprays don't offer the best color result. And I know what they mean. 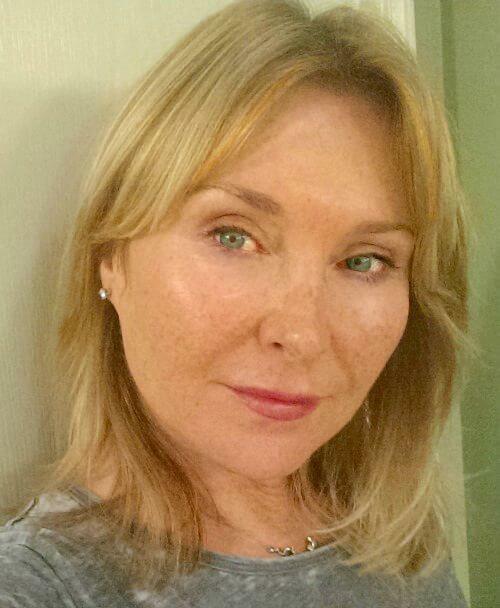 I've been using self tanners for over 30 years and some made my face look dark, but dirty and dull. If you're very pale consider using a lighter toned tanner and consider and have consider spending a little extra and get a good quality tanning cream. If you haven’t had any luck with self-tanning facial products, consider giving this one a try. It is a hydrating, anti-aging self tanning cream. Bonus Beauty Tip: For a face slimming effect - try smoothing a little extra self tanning cream down the sides of your face and neck and under your chin. This can help slim a full face and/or camouflage a double chin. As we age our lips tend to thin out. They lose shape and definition. I found a simple solution to this issue that only takes 2 minutes and lasts for hours. It's a one time cost solution that you can use over and over again without having to spend thousands of dollars for lip injections. Click here to learn more about this Lip Care product. 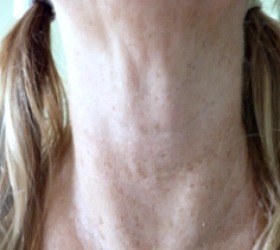 Help smooth neck wrinkles and lines and – over time – help reduce cording…i.e. turkey neck! This tip comes from Carolyn’s Facial Fitness workout. It’s easy and quick and if you do it consistently, you can help improve skin tone and texture on the neck. NOTE: It's easier to do the Brush if you watch this video first. Click here to see the Brush video. Apply a moisturizing cream under your chin and all over your neck. NOTE: I use her potent Vitamin C Crystal Serum. Then make a fist with your right hand, (using the flat side of your fingers between your first and second knuckles) slowly “brush” your double chin area. Start "brushing" from the right side of your under chin area. Then go across the whole under chin area to your left side. Move your hand down an inch and begin "brushing" back to the right side. Then move you hand down an inch again and "brush" back to the left side. Repeat this movement until you've reached your collar bone. Perform the brush twice a day in morning and evening several times a week. Whether you were born with full chiseled cheekbones or not; this beauty tip will help make the most of your cheeks as well as your face and neck. Got your own beauty tips for face or neck? Click here for more great anti-aging solutions and tips! What's your favorite anti-aging routine? We'd like to hear about it. 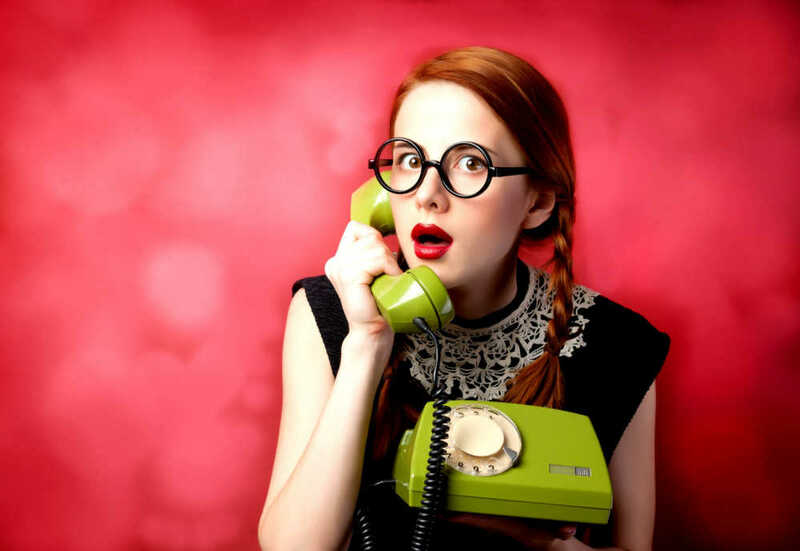 Visit Popular Anti-Aging Systems and tell us what your using.